A dark shape wobbles beneath the water, getting closer to the beach. You’re ninety-nine percent sure it’s just seaweed drifting on the currents – but what if it isn’t? What if it’s one of those big saltwater crocodiles Harrison warned you about? You look up and down the beach. There are crushed shells, dead jellyfish and a shapeless mountain which might once have been an epic sandcastle – but no people. No one to ask for advice. Nobody who will call for help if something happens to you. You didn’t even tell anyone you were going surfing, which now seems like a mistake. The clock is ticking. In the 30 minutes from the time you notice the shape in the water life as you know is over. You are on your own. Your decisions will be life and death ones, and not just for you. Get it wrong and at the very least, you die. Get it right, you may save lives, save livelihoods, be a hero. But this is no game. This is deadly serious. There are multiple possible endings – which will you choose? Jack Heath is known for action-packed stories and this series of Choose Your Own Ending stories is no exception. Who know there were so many ways to die? Or live? Full of extreme options, every horrible ending man-made and ‘natural’ element seems to have you in the crosshairs. The stories are told in second person and present tense and the pace is fierce. Recommended for mid-primary readers looking for some choice in how the story ends. Will also appeal to older fans of wild adventures. The lump of ice slipped from beneath Nika’s fingers, and suddenly she was falling. And caught a narrow crack in the glacier. ‘400 Minutes of Danger’ is a collection of ten short stories, each taking approximately 40 minutes to read. There are countdown markers along the side of each page, so it’s clear just how much – how little – time there is before disaster strikes. In some stories, eg ‘Mosquito’, the main character is on a mission, but in others, eg ‘Kill All Humans’, the hero is unexpectedly called to counter danger, either alone or with the assistance of another character. All stories, whether set in contemporary or fantastic worlds, are full of action. Adults don’t fare well in these stories. The protagonists are all teenagers – a range of ages – and they are much smarter, faster, better people. Baddies are truly bad, and technology is not always helpful. These short stories will be great for readers who like their action fierce and pacey. The time markers on the page help the reader keep track of the remaining time and help monitor the tension. There’s a good balance between male and female protagonists, working alone and working together. Recommended for mid- to upper-primary readers, and secondary readers looking for a quick and accessible read. Young writers might also look at the time markers to see how pacing is used to progress the plot. It doesn’t look like any train you’ve ever seen. It has the usual parts – sliding doors, plastic windows, massive grinding wheels – but it’s facing up. The mountain is so steep that the rails are almost vertical. How is that supposed to work? It’s only one carriage long, but still. Can trains even go uphill? Despite the strangeness, it seems familiar. As if you have taken a ride on it before. Unsettled, you glance at your watch. Wasn’t the train supposed to depart an hour ago? ‘Countdown to Danger: Bullet Train Disaster ’ happens over the space of 30 minutes. A 30 minutes that stretches and contracts depending on the actions of the viewpoint ‘You’. ‘You’ are taking a ride on a prototype almost vertical bullet train in an unnamed but obviously mountainous location. Your friend Pigeon is there, and as the train takes off, a boy named Taylor comes hurtling down the central aisle, headed for injury or death. Like a puzzle, your decisions may lead to survival, but other paths may lead you to very different (and less pleasant) outcomes. In total there are 30 paths that you can take. 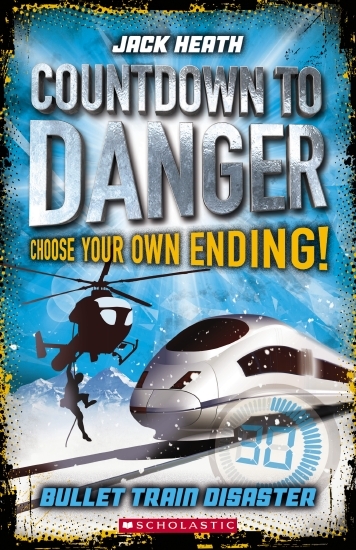 ‘Countdown to Danger: Bullet Train Disaster ’ is the first title in a new series from Jack Heath and Scholastic. It is told in the second person so that even the gender of the main character is not fixed. Readers can choose to follow different paths – and predict which way to proceed. Instructions at the end of each chapter direct the reader, or offer them options. With thirty paths – only ten of them leading to survival – and a digital clock countdown as chapter heading, the pace accelerates, no matter which option you follow. The chapters also become shorter as time ticks away. Great for critical thinking, also ideal for reluctant readers and those wanting to control their progress through a story. Recommended for mid-primary readers. Agent Six of Hearts braced his hands against the hot walls of his steel coffin. The rubber pillow under his head barely lessened the shuddering against his skull as his tiny vessel blasted through the ocean. The web of safety straps around his torso hummed like high-voltage power cables. He checked the flickering screen above his head. Altitude: 28 metres below sea level. Speed: 150 kilometres per hour. Distance from target: 5.9 kilometres. A little over two minutes to go, he calculated. Six is back in his fourth adventure and the stakes are the highest yet. The action begins with Six being propelled in a modified torpedo through the ocean towards a large battleship. His mission is to prevent ChaoSonic releasing their latest weapon, a deadly virus designed to wipe out resistance in the South Side of the City. Despite the challenges, this is a relatively routine mission, he thinks. But nothing can prepare Six for the challenges he will encounter, the first of them within minutes of boarding the battleship. Each skirmish he faces adds to his mystery and confusion. Nothing is as he expects. Who is calling the shots? There are several contenders: a villain he’s battled before; the man responsible for his existence: and a scientist and her invention. His people are threatened, danger is everywhere, and time is short. Third Transmission is an adventure in time and place. Set in a future world there is enough familiar to ground the reader but enough technology to make almost anything possible, it’s a wild ride. The City is controlled (mostly) by ChaoSonic and the sea is held back by a Sea Wall. Current environmental predictions have proved true and rising seas, pollution and acid rain are all part of Six’s world. Heath embraces scientific technology fact and theory and uses his hero’s speculations and discoveries to allow the reader access to the wildest of possibilities. Six is chronologically an adolescent but mostly he performs as a highly trained operative. In this instalment of Six’s adventures, Heath has allowed his character to show some emotional development appropriate to his age. Recommended for futuristic adventure lovers 13+. Six of Hearts is sealed inside a torpedo, blasting his way towards a warship at 150 kilometres an hour. This book is the third and final story in the Six of Hearts series. It starts with Six trying to steal canisters containing a weaponised strain of the SARS virus, and ends before this event. He has to achieve a series of increasingly challenging tasks, and he continues to achieve, with dozens of stunts, assignments, and life-threatening tasks for the Deck throughout. Once the story begins to take off, we discover a time machine, a spy within the Deck, and Six and Kyntak’s assassin sister. Third Transmission is an exciting, post-apocalypse adventure, the third in this series. A great read for all readers of the first two books. 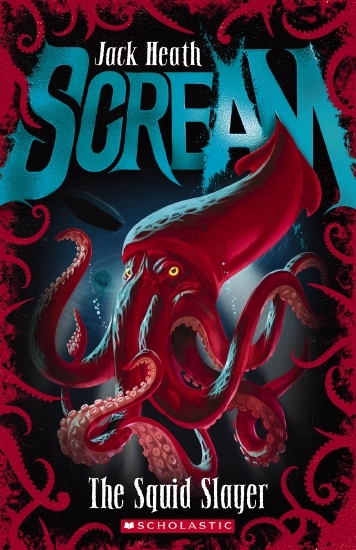 Lots of excitement and gripping tales await the reader of this book. A great end to the Six of Hearts series. His stomach clenched. Blood pumped. Gravity kept pulling at him, and he kept accelerating. The wind tore at his hair and beat at his unprotected face, making him squint. Drops of water crawled upwards across his body, as though trying to escape the impact. His heart vibrated crazily, and the adrenalin flowed freely at the thrill of speed…He bent his legs slightly and braced himself for the impact, clenching his teeth. As the strongest and most invincible agent in the Deck, a team of special agents fighting to uphold justice and values, Six of Hearts is used to getting into scrapes. Battling against ChaoSonic, the company that controls the city, the Deck sends Six on numerous dangerous missions to uncover and remedy injustice. But Six has a secret. He is the product of illegal genetic experiments conducted by the Lab – a division of ChaoSonic. The agency he is fighting is the same one that created him. If the other members of the Deck find out, he could be expelled, or worse. Then, as he investigates the Lab’s current activities, Six meets a boy with identical DNA. Is Kyntak someone he can trust? Six must face his most dangerous mission yet. The Lab is a thrilling young adult novel set in a chilling future of chaos and greed in a world almost destroyed by pollution and war. With a chilling, almost clinical telling, reminiscent of Matthew Reilly’s thrillers, it is aimed squarely at young male readers, in the high school age group, and is sure to appeal to such readers.